To increase the speed of the distillation you can tilt the fermenting vessel. 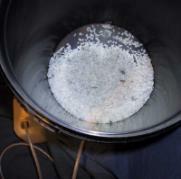 All distillate that condensates inside the fermenting bucket will be removed by tilting the vessel. The product will be slightly weaker but you gain speed up to 1.5 litres a day. This design is great to use as a prestill if you use a fractioning apparatus or potstill. Tilt the fermenting bucket and instead of a false bottom you add 2-3 litres of washed gravel. The gravel will build up a horizontal bottom so you can place your 10-litre vessel upright. On the side of the fermenting vessel you drill a hole and add a hose, this is where your product will be removed. 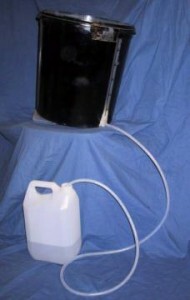 In this example the fermenting vessel is painted black. That is not necessary but will cool the vessel slightly and increase speed. Black object radiate more heat. Do not use it in sunlight if it is painted black, because black will absorb sunlight and get warm; this is the opposite of what we want. Anther way to increase speed is to dome shape the lid on the fermenting vessel with a hot air gun. That way you can keep the false bottom and don’t have to tilt the vessel. Takes some skill though to shape it.